Carolina Tombolisi makes her shimmery pouches from a sustainable paper fabric with a leather-like texture. 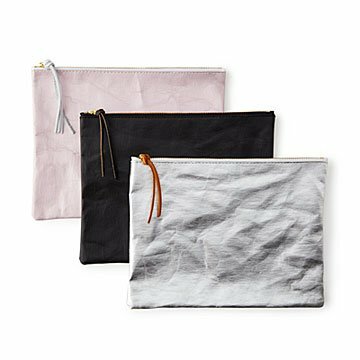 Carolina Tombolisi's elegant, shimmery cosmetic pouches are made of a unique, leather-like paper fabric we loved at first sight—and touch. Light, strong, and flexible, it's made from a patented blend of recycled polyester felts and sustainably grown virgin pulp wood fiber. The zippers are reclaimed from blue jeans. Stylish yet sensible, they've got plenty of pretty for dressy nights out, but can easily handle daily wear and tear—including repeated machine washings. Handmade in Los Angeles, California. Carolina Tombolesi studied architecture at California State Polytechnic University, and later at the University of Buenos Aires in Argentina. She worked for over 15 years as a project leader in a Los Angeles architecture firm, responsible for the design and delivery of high-profile hospitality, retail, entertainment, and mixed-use developments. When she decided start her own design and management consultancy, she discovered a craving to do hands-on design for people’s everyday lives. While designing an espresso set with leather coasters, she stumbled across a unique, leather-like paper fabric. Instantly recharged and inspired by its possibilities, she bought some and began experimenting to see what she could create with this incredible material. We love the results. Wipe gently with warm water and soft cloth.